First an update: Went to the barn last night after work. Let Possum out to graze and proceded to go through my endless pit of horse paraphanilia called a tack trunk. I didn't even realize how much stuff I had and owned. I swept out the back of where the trunk was and organized all of my stuff putting it in their respective piles. I then proceded to drag every piece of leather that I own outside and began to clean, oil and weather proof it all. When I was finished everything was sparkling and new looking. I put everything in their garment bags to stay clean, grained and then put Possum back out in his paddock and went to "G"s for a nice dinner of cheeseburgers and pasta saled. This morning I washed all of my polo wraps that I'm going to use next week and tonight will go to the barn and collect all of my saddle pads to be washed and sorted out by color days. It feels good being organized and ahead of the 8 ball. I also fixed Possum's new leather halter that he hasn't been able to wear since the throat snap broke last winter, so I did some tinkering and it's like new. He's gonna be all decked out and snazzy at the fair. I'll have to make sure people take pics that I can post here after. This pic was sent to me by a member of my barn, So I happen to know this rider and horse very well but will be as fair and honest as possible. The rider here has great posture and her head is up and her back arched. Her release is appropriate although at her level she could start practicint the automatic release. This will cause her to have a more independent seat from hand and increase the strength of her body to maintain posture and balance while not using her hands to help her. She is jumping ahead some but still looks to be balanced. Her leg is in a fairly good spot, but due to her jumping ahead it has slipped a little behind the girth, but still looks to be strong. Her heel could be a little more flexed, but it's still pretty solid. 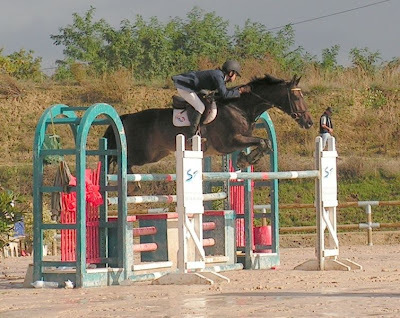 The horse is showing a nice and even powerful jump and is taking off evenly behind. AT this point in her training she could use a lot of trot work and trotting deep into fences to get her knees up more and clean. The mare is using her neck and back properly though and looks to be quite powerful. Over all a nice picture and goood effort by horse and rider. This next pic was also sent to me by a member of my barn, but again I will be as honest and non biased as I can. Although it does help to know the horse and rider combination. Let me start off by saying that the turnout of this team is excellent. The horses coat shines with care and grooming. 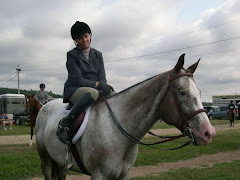 The rider is neat and clean in appearance from the shine to her boots and the horses hooves polished. This is a great example of a hunter turnout. 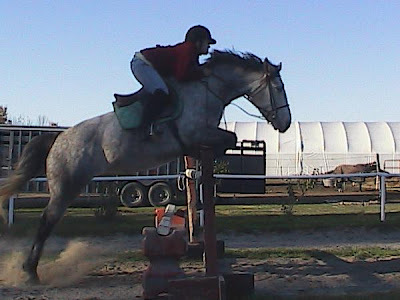 Now this pic is hard to judge for the fact that the horse is already over the crest of the jump and starting to land. The riders position is solid and correct. Her back is arched and not forced looking, her head and eyes are up. Her leg is right at the girst with a lowered heel and she is using an appropriate crest release. My suggesttion to this rider would be to have a little more toe out angle. The way the stirrup is makes it hard to achieve this. Reposition the stirrup slightly so that you can maximize your heel depth and calf on the horses side. The horses legs are uneven due to his landing soon and he is merely cantering over this fence. Trotting bigger verticals and cantering spreads will get the horse to maximize his body and use his head and neck to achieve that nice bascule that we look for un hunters. As for equitation the pair look great and ready to take some ribbons in the show arena. Lastly this is a pic that I found that I really like. I love this woman's equitation for the most part. Her leg is nearly perfect with the correct knee and toe angle. Her body is right over the saddle and she is not jumping ahead or getting left behind. Her back is flat and her head and eyes are up. She could make the picture even better by using an automatic release instead of a crest release so that she could have straight line from bit to hand instead of the broken angle we see here. She looks to be more than capable of doing an automatic release. The horses knees are up and together and this seems to be a fairly large jump. The rider looks strong, focused and balanced which is what I like to see. The horse has an awful expression with ears pinned and eyes squinting which takes away some from the picture. I can't talk, my Possum has his ears flat all the time while jumping. It's because he is very serious and jumps with ferocity. But I just wanted to point out this rider and how nice she looks. She is in conseravatice attire perhaps schooling in a warm-up arena or lesson. One thing that she could do is square her shoulders a little more and lengthen her neck slightly to get a little more arch in her back and have a longer frame, but hos eare mostly style points. She is very effective the way she is right now. I was asked to clarify more the proper releases, her is a short explanation and some pics to help. Differenent releases are used depending on circumstances. However, all riders should strive to readily be able to use each one as needed, and should practice them all. Basic release: the rider grabs the mane of the horse. This allows the rider to avoid falling back and hitting the horse in the mouth or back, or try to use the mouth for balance. It is used by beginning riders who do not yet have the position and balance to do more advanced releases without risking hitting their horse in the mouth. It is also used by more advanced riders on green horses, who tend to overjump, or when a rider for some reason loses position due to an awkward jump. Riders should not think it is reserved for novices, and all good riders will grab mane to save their horse's mouth. However, it provides the least amount of control. It should therefore not be used if it is not required. 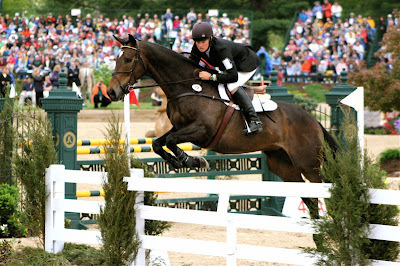 Short crest release: the rider slides the hands up the crest as the horse takes off, not before (which "drops" the horse). The hands should not slide far up the crest, only a couple inches, as needed. It provides support for the rider's upper body, while still providing a good amount of control because the rider did not release any more than needed. Best used on verticals, when the rider needs to turn mid-air, or when going down drop fences. An intermediate release. Long crest release: Similar to the short crest release, in that the rider slides his hands up the crest, but the hands are pushed much further along the neck. Gives a great deal of freedom, but fairly little control. Best for very wide oxers, to allow the horse to really stretch across, or for green horses that may jump large or awkwardly, for gymnastics grids, and for use on horses that have been hit in the mouth over fences and are reluctant to jump or stretch down over a fence. The rider should be careful not to associate a large movement forward with the hands and elbows to mean a movement forward with the hips. The hip angle should still close backward. Many riders get into the habit of jumping ahead with this release. Critics say this release is overused and exaggerated by hunter riders; in the hunter ring it is often used by experienced and/or professional riders on well-trained horses over jumps of relatively modest size. Proponents say that this shows off a talented hunter by proving the horse needs little assistance from the rider to jump in good form. Automatic release: The most advanced release, where the rider maintains a soft, elastic, steady rein contact with a straight line from elbow to bit as the horse jumps. This release results in a great deal of control and communication between horse and rider, allowing the rider to signal to the horse what to do on landing. 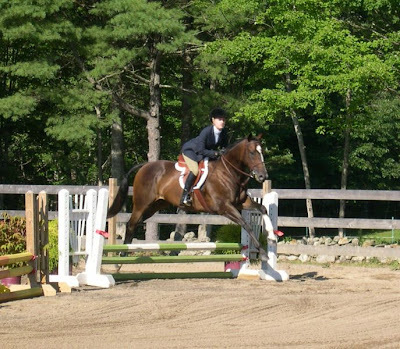 It allows the rider to better turn while in the air, to correct horses that jump crookedly, and to provide the support that some horses prefer over fences. It is also good on horses that need lots of control after landing. 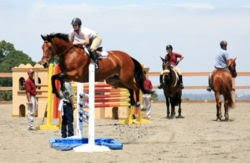 However, the automatic release requires perfect balance from the rider to be executed correctly. An unsteady rider will catch the horse in the mouth, and an incorrect automatic release will spoil a horse's jump and confidence. However, if a rider is able to perform it correctly, it is often best to use this release whenever possible. Very useful in show jumping and eventing, where control is very important. Pictures here is the short crest release. Usually about where the martingale is on the horses neck. Grabbing mane for balance is also acceptable and encouraged especially for beginner and intermediate riders to prevent them from losing their balance, landing in the saddle o ver the jump or pulling the horse in the mouth. Next here we have an example of a long crest release. Being used for a large oxer to allow the horse more freedom. Some common mistakes using the long release is over jumping, or jumping ahead of your horse. This rider in the picture demonstrates that she can use the long release but still maintain her center of balance. 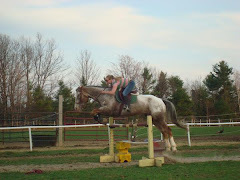 I have posted this before but this is me attempting the automatic release with Possum over a 3'6" oxer this spring. Hope this further explanation helped to clear things up for folks. Thanks so much for the critic and the nice comments. I will be sure to show Kayla your input and suggestions. One thing, for my benefit really, but could you explain the crest vs automatic release? I think I have an idea what you mean but I'm not certain. Could you contrast that last picture with one you think illustrates a good automatic release? I am having a hard time still grasping this concept and I think seeing contrasting pics would help. The mare is actually a boarder at our barn and they believe that the damage to her eyes was due to acid being thrown into them. So with the owner trying to trace everything back she suspected that it was kids who did it, teenagers most likely. She is a sweet little arab mare, all black. That helps alot! I understand now. I also understand what my instructor was trying so hard to teach me during our last few lessons - the long release. She rarely used the terminology with me, which baffles me..., but she was trying to get me into that - I don't think I was ready, as it was not working well at all and I was frequently hitting my horses mouth or releasing too soon throwing him away and completely confusing him - he was insecure over jumps anyways so a little contact was key for him. I remember not understanding what was wrong with how I had been doing it - grabbing the mane.